It’s rare that you get the opportunity to team up with comic book superheroes, but Justice Machine can grant you that childhood dream. This epic 1X2 Gaming creation has the perfect blend of adventure and fast-paced game play. The 5x3 board setup has 30 available pay-lines across all stakes. 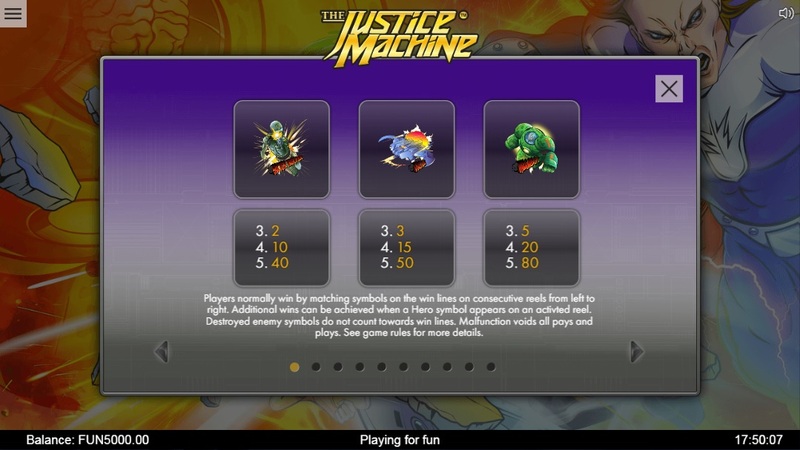 Justice Machine has some unique bonuses on offer, such as: Special Power Bonuses, Free Spins Feature and a Justice Machine Bonus Round. You certainly won’t be struggling for action when you play Justice Machine. Play today and battle the in-game villains. Join today! The Justice Machine team might not be the most popular set of superheroes, but they’ll certainly go up in your estimations once you’ve played this slot. Upon opening the game, you’ll immediately notice the individual superhero symbols that appear on the reels. For low value winning combinations, the symbols to look out for are: Megabot, Drone, Sector Trooper and the Justice Machine logo. The higher paying symbols are represented by Justice Team members, such as: Talisman, Blazer, Chain and Demon. Those symbols also have individual bonuses attached to them. * CHALLENGER FREE SPINS – To trigger the Free Spins, Challenger’s power will activate and credit you 10 free spins. * JUSTICE MACHINE BONUS ROUND – Diviner will activate this BONUS round by appearing in a power activated reel. Once you’ve activated the bonus, you’ll be directed to a new window where you must select individual superheroes to attack the villains. You’ll receive a multiplier that will be applied to your initial stake for each attack. This bonus will end once all enemies have been destroyed. * TALISMAN – You’ll receive a random cash prize when Talisman’s power activates. * BLAZER – Enemy symbols will be destroyed by fireballs for cash prizes when Blazer’s power activates. * CHAIN – Enemy symbols will be destroyed by lightning bolts for cash prizes when Chain’s power activates. * DEMON – You’ll receive a win spin when Demon’s power activates. * TITAN – This symbol is WILD but it will fill the entire reel when Titan’s power activates. There are more general Easy Slots promotions here. 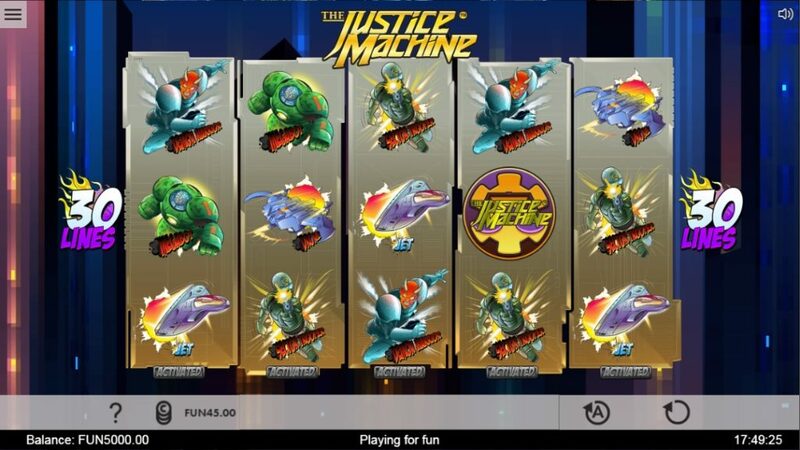 You don’t have to be a fan of comic books or superheroes to appreciate this Justice Machine slot. The best thing about this game is the constant bonuses that are activated by each individual superhero. Combine those with a Free Spins Feature and you’re guaranteed some incredible action. play today! 1X2 Gaming are onto a winner with this creation. Play today and enjoy the entertainment from this comic book classic. If you enjoyed Justice Machine why not try other online Easy Slots game.